Aw, poor Murphy. 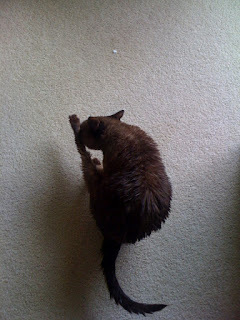 He got a bath and looks like a drowned rat kitty. Heh heh. I'm not evil, he was just shedding too much and Trav is allergic. Murph is forgiving though, and even wants to cuddle while he's dripping wet. Anyway...back to my friend the treadmill last night because it was pouring/hailing outside. My movie of choice was Ace Ventura (allllllrighty then). :) I alternated 2 min run with 2 min walk for 20 minutes. Took a break and then wasn't satisfied with only 1.6 miles...so I finished Ace while walking fast on a 6-8% incline. Holy booty! :) Loved it! Total of 3.6 miles. I really want to sign up for the Nordstrom Beat the Bridge again this year. It was pretty much the race two years ago that threw me back into running reality. No 8K PR, mind you, but I'm going to beat that damn bridge! :) Plus, it goes through my alma mater's campus (and where I met Trav)! In other news, Goober (aka the little bun in the oven) is healthy and now 12 weeks into the baking process. I actually got to hear he/she's heartbeat at the doc's today...it was amazing. I wish Trav could've been there to hear it. Doc was like "Yup, no denying it now. You are pregnant." Um, yes, thank goodness it's not a tumor or alien. ;) I'm not "showing" yet, but to me, my waist is disappearing. I look like a boy with no defined waist. :( Oh well. Have you talked to your doc about running the race while preggers? I would get his ok and then go for it! How exciting that you got to hear the heartbeat today! The race sounds fun. I love races that are tied to great memories. Hearing the heartbeat is such an amazing thing. That first ultrasound where it doesn't look like a blob is amazing also. I am sooooo excited for you. Good luck with the 8K!! yay nothing like hearing that heart beat that sounds like a freight train. I used to love that. Sometimes I wished I could have owned one of those heart beat monitor things so I could listen to it all day at home! So exciting! I totally think you should do that 8K. It sounds like fun! Aaawww....baby. So sweet. It's amazing to think you have a small person living inside you. That is so exciting!! I loved hearing the heartbeat for the first time. I just makes it so real!!! my Mini-van's name is Murphy, when my three year old saw the picture of "Murphy your cat she wanted it because his name was murphy and his hair looked funny!" So exciting to hear the heartbeat! Glad to hear that Goober is doing well! Keep cookin' that bebe! Eeek!! So exciting you got to hear the heartbeat!